MIST Pool Bar is the island’s hottest wet spot! Here, guests can immerse themselves in the beautiful setting. The sounds of the waterfalls crashing sets the tone. Swim right up for a hand crafted cocktail while enjoying the scene. 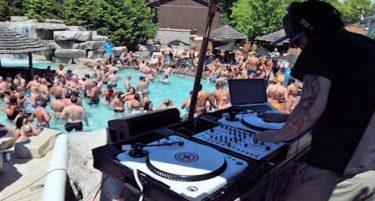 Weekends feature outstanding local DJ’s spinning tunes. The scene is electric! Weekdays offer a more relaxed vibe, a respite from the hustle of daily life. Be sure to check the Entertainment Schedule, as great acts play on the pool deck throughout the season. MIST is located behind Mr. Ed’s Bar and Grill. Mr. Ed’s is situated in the heart of downtown Put-in-Bay on Delaware Avenue. Also, the Subway Restaurant is just outside the gate for the pool bar. This central location makes it very accessible from anywhere on the island. First, there is a neat swim up bar that can accommodate up to 15 guests. Cool off with a frozen concoction while cooling off in the water. Second, the two waterfalls that flank the pool area truly set the mood. During weekdays, the pool transforms into a relaxing oasis, compared to the party atmosphere on the weekends. Laying out on the many pool chairs while listening to the water is a lovely escape. Third, the pool itself is over 2000 square feet. So, there is ample room for even the largest of crowds. Lastly, for those wanting to have their own space with exceptional service, renting a cabana is ideal. Here, guests can expect an exceptional experience. Read on to learn more. For groups, especially bachelor parties, a cabana is the absolute best way to experience MIST. Cabana guests can expect the highest level of service and comfort. A dedicated space is allotted for each group. Also, a fine selection is available for bottle service. This includes all of the best mixers to go with it. Also, a personal cabana attendant is assigned to each group. Furthermore, they will ensure your group will want for nothing. Refills on beverages, taking and delivery of food orders and more will be provided with a smile! Cabana guests can order from the Full Menu at Mr. Ed’s Bar and Grill or opt for a sandwich platter from Subway. Regardless, your group will have a memorable time at the VIP Cabanas. So, during your next trip to Put-in-Bay, be sure to include MIST in the plans. Ranging from a relaxing afternoon during the week, to an all out party on the weekends, their truly is something for everyone. Fun in the sun with friends at MIST is a must! So, stop by the island’s HOTTEST WET SPOT for a time you won’t forget! !